I was born in Harlow, Essex, and after completing my Art Foundation course at Harlow college I moved to Wakefield for three years where I studied Surface Pattern Design at Bretton Hall college of Art (part of Leeds University), which I loved. I was encouraged to use portraiture in my textile designs as I had such a passion for painting in this style. After graduating with a First Class honours in 1997 I gained a place at The Royal College of Art, London, where I studied Printed Textiles for two years. I have worked in design studios ever since. 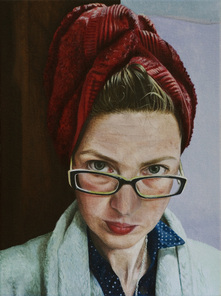 Along side my textiles career I have worked on a variety of commissioned portraits and other figurative works for exhibitions around London, including the 'BP Portrait Awards' at the National Portrait Gallery, and the Mall Galleries. I currently live in the East End of London, Tower Hamlets, UK. 'Artists & Illustrators' magazine - 'Life Drawing' interview August 2011 edition. 'Artists & Illustrators' magazine - 'Portfolio' March 2011 edition.